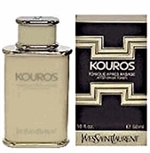 YSL introduced Kouros in 1981. This fine fragrance contains coriander, bergamot, sage and is accented with honey, vanilla and tonka. Kouros is perfect for casual use. I use it every day and love the smell and so do others. I get complemented on it all the time. Big favorite for ever ! I highly recommend this product. I am mexican- Italian, and I have tried products from Italy, but I prefer this. Product is being used as needed.